The cabal that is in control of Dunedin will not allow the appointment of a city administrator in place of the DCC. 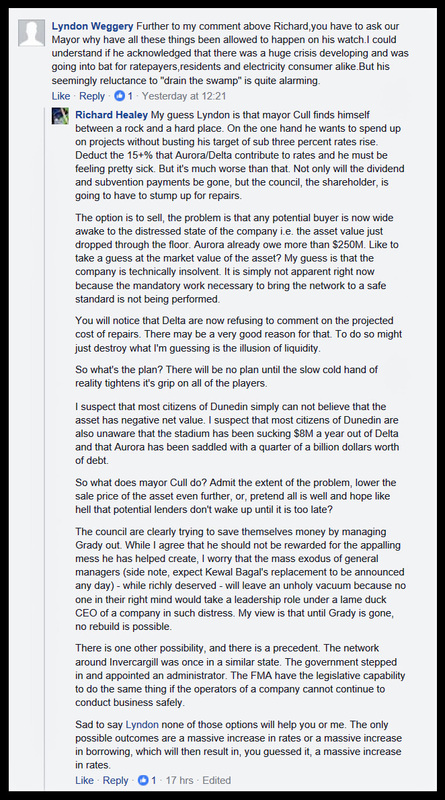 Ray, I think there will be no choice given the grievous disarray of council finances, present and future in the face of so few Dunedin ratepayers – and the fact that it’s a national requirement to provide basic core services to New Zealand people (not the least, water and power). Things at Dunedin are going to implode incredibly fast. Right now DCC should be having Emergency meetings and not be relying on DCHL twerps to filter the doom fast unfolding in the CCOs. They won’t of course – possums in headlights is DCC. You figure out the missing letters! New note at Richard Healey’s Facebook. The case of how a [imperfect] perfect pole screws the [perfect] replacement time at South Dunedin, counter to the [un]critical thinking of Aurora’s new program director Godfrey Brosnan who has spent so little time in the lines industry. So not hopeful, people. There are once again a lot of things to be taken from the Churchill St pole story. The Delta linesmen are certainly awake to the extraordinarily dangerous situations they are working with. Well done guys. Their “Pole Replacement Director’ Brosnan is not. The extent of the rotten pole problem in South Dunedin is unknown, but given this example probably very extensive. The best source of news updates surrounding the dangerous pole replacement program is not coming from Delta. The public needs to know this stuff. Time for some more national TV coverage? Richard Healey’s experience and extensive industry knowledge of the Delta patch should have been highly valued by Cameron and his sidekicks. Yet they drove him out. Richard Healey’s predictions to date are certainly right on the mark. The guy knows what he is on about. Brosnan with his first press interview showed that he knows precious little about the job he is being paid so generously to direct. And finally, a question of Grady Cameron, as he is still ‘in charge’. Or can Mr Thompson or Mr Crombie answer that quickly? This crisis is growing daily and could bring Dunedin City to its knees. I suppose that it’s a bit like the wooden villa that you buy, which just has a bit of rot here and there. Then, when you open the thing up to repair that odd bit of rot – well – we all know what comes next. Except, Rob, the wooden villa isn’t going to kill tradesmen working on it, nor set fire to property -w-a-y- out of sight from your cracked window….